Brenden Hosler throws for Franklin Monroe Jets in game against National Trail. The Jets scored early and had the lead for a good bit of the game against a solid National Trail team. But in the 6th inning Trail scored all of the runs that they needed to defend their home field. The Jets tried to get a rally going in the top of the seventh, but they only scored one more run to make the final score 6-3 in favor of Trail. Still for five innings the young Jets team played well. One of their scores was an exciting suicide squeeze. Caden Goins was able to reach base when he was hit by the pitcher, advanced to second on a stolen base, and made it to third when Dalton Goubeaux bunted. Right after a Trail time out coach gave the signal and so Ethan Coppess was able to lay down a bunt and Goins raced down the 3rd base line for the run. They showed grit in the seventh when they tried to fight their way back in the game. Goins was hit by a pitch (again). This time he seemed a bit sore so Dylan Brumbaugh was brought in to run. He was able to score when Gabe Sargent hit a sharp grounder and the throw was off target. But the throw to first was on target for the next batter and that out ended the game. Starting pitcher Brenden Hosler pitched a decent game most of the way. He had 6-strikeouts and gave up 4-earned runs. He had a situation early in the game where he showed some poise. He hit a batter, allowed him to advance to second on a wild pitch, then settled himself down and coolly struck out the batter to end the inning. He pitched most of the game with Goins coming in for relief. Webb would be the pitcher of record for Trail with Moore coming in as a closer in the seventh. Franklin Monroe hitting: Seese 2-3, Timmy Lawson 2-3, Goins 1-2, Goubeaux 1-3, Sargent 1-3. Stolen Bases: Goins, Sease, Sargent. 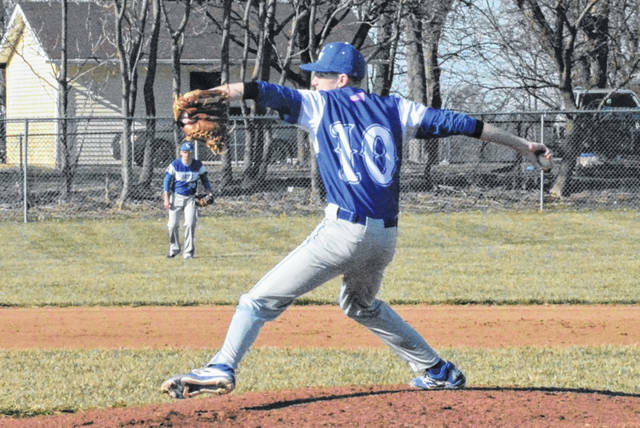 https://www.dailyadvocate.com/wp-content/uploads/sites/34/2019/04/web1_Brenden-Hosler.jpgBrenden Hosler throws for Franklin Monroe Jets in game against National Trail.